The North Atlantic is what is known as a temperate sea. That is, it is not tropical like the Caribbean, nor is it polar, like the arctic ocean. Because it lies somewhere between these two extremes in temperature, the North Atlantic has a strange mixture of different types of creatures. In the film, viewers learn how planktonforms the base of the ocean food web and how plankton produces a large abundance of life in the cool waters of the North Atlantic. The film is a good introduction to the major marine vertebrate and invertebrate phyla, but is also unique in that it reveals many creatures which are found no where else on Earth! The film describes things in way which makes them interesting to learn. Sure, everyone has seen a sea star, but how about an extreme close-up of the sea star's tube feet in action? This is sure to make sea stars seem a little more interesting. The film has a variety of amazing animals captured on film in their natural habitat, like sharks, skates, flounder, lumpfish and much more. 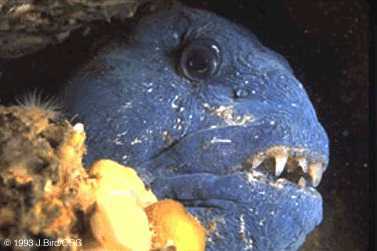 An Atlantic Wolffish, one of the interesting inhabitants of the North Atlantic.